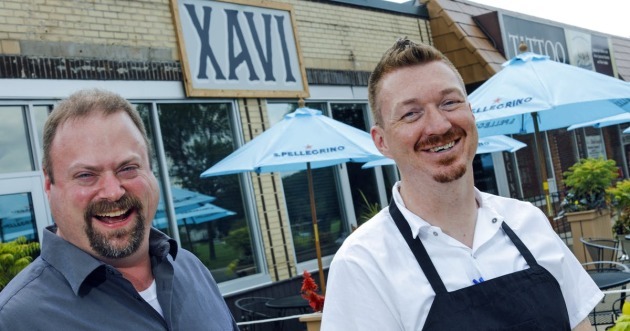 Xavi, the well-run charmer that drew admirers to 56th and Chicago in south Minneapolis, has closed. “It’s been hard, but we have come to the conclusion of Xavi restaurant,” is the message that co-owners Michael Agan and James Elm posted on social media on Sunday evening. (That's Elm, left, and Agan, above, in a Star Tribune file photo). The closing is a loss for the local dining scene. When it opened in 2016, the restaurant took over the space that had been the longtime home of First Course. Agan, the restaurant’s chef, delivered an agility and level of creativity to his cooking that was a cut above the standard-issue neighborhood restaurant. Elm was the friendly face behind the host stand and the bar. Between the efforts of these two longtime pals -- and Twin Cities restaurant veterans -- the small-ish (60-seat) place just clicked. “We’ve always wanted to have a little restaurant,” Agan told the Star Tribune in 2016, shortly before Xavi opened. Here’s hoping that their talents surface in other Twin Cities establishments, and soon.